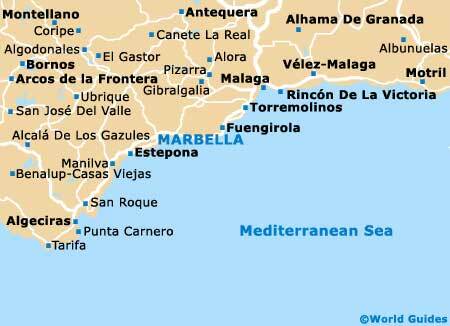 Marbella lies on Spain's southern coastline, in the heart of the Costa del Sol. With a stunning backdrop of the Sierra Mountain hills, the city has long been one of the region's most popular resorts. Marbella is a wealthy area and despite its considerable tourism industry, the city retains a historic character in many neighbourhoods. Much of its charm is centred around the Old Town district and the spacious Plaza de los Naranjos, a public square in central Marbella, surrounded by many grand buildings, including the town hall (ayuntamiento). Large areas of the city were renovated and improved during the 1990s, including many of the streets and beaches. With a stunning coastline stretching for more than 25 km / 16 miles, the sandy beaches are without doubt the resort's main tourist attraction, with many being lined by the Paseo Maritimo, a scenic boardwalk. With such an enviable coastal setting and beautiful beaches, it is no surprise that tourism is an important part of life both here and along the Costa del Sol. The main tourism bureaus in Marbella include the Central Tourist Information Office on the Plaza de los Naranjos and the Seafront Tourist Information Office on Glorieta de la Fontanilla. 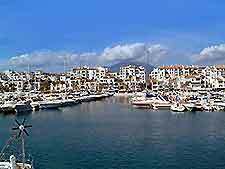 Marbella is divided into a number of notable regions, which include the Old Town district, the downtown district, nearby Puerto Banús, and both Estepona and San Pedro de Alcántara, which are often considered to be suburbs. The choice of accommodation in Marbella is extremely varied, ranging from cheap hostels to spectacular hotel complexes along the seafront, particularly around the Playa del Pinillo beach and Puerto Banús. Often close to beaches and featuring private outdoor swimming pools, hotels in Marbella are particularly busy during the summer season and winter months, quickly becoming booked up. Well-known brands and chain hotels offer some of the best rooms and most competitive rates, although local guest houses also offer good value for money. More information about Marbella Hotels. The city's main tourist attractions include the Paseo Maritimo - the famous Marbella boardwalk, stretching along the beachfront, offering outstanding coastal views; Plaza de Toros - the Marbella bullring, a notable landmark on the resort's skyline, with a capacity of around 10,000 spectators; and José Banús Port - a busy marina with many waterfront restaurants and shops, and a particularly vibrant nightlife. Further top tourist attractions in Marbella include Basilica Vega del Mar - ancient ruins of a 4th-century church, where many important excavations have taken place; Murallas del Castillo - the Castle Walls, a vivid reminder of the area's past, located in the city's Old Quarter; Las Bóveda - the Marbella Vaults, historic remains of Roman baths, with guided tours and well-preserved features; and Villa Romana de Rio Verde - significant remains situated on the outskirts, with many archaeological treasures. This busy Spanish resort is also home to a number of noteworthy gardens and parks, such as the Parque Arroyo de la Represa, the Parque de la Alameda and the Auditorio de la Constitución - which is situated alongside the seafront. 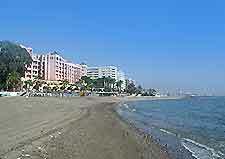 More information about Marbella Tourist Attractions and Marbella Landmarks. Some of Marbella's main museums and art galleries include the Museo del Bonsai - an unusual display of bonsai, standing within the extensive grounds of the Parque Arroyo de la Represa; Contemporary Engraving Museum - containing a large collection of historic engravings, together with art works by Picasso and Miro; Municipal Exposition Gallery - situated in central Marbella, with many temporary exhibitions throughout the year; and the Casa Grande - with large gallery spaces and changing displays of paintings and sculptures. More information about Marbella Museums and Art Galleries. Tourist attractions located nearby Marbella include the popular coastal resorts of Malaga and Torremolinos - both of which offer endless beaches, water sports, theme parks and nightclubs; Granada - an exciting city with many ancient attractions, including the 13th-century La Alhambra fortress, Albayzin Walls and vast university campus; Seville - the fourth-biggest city in Spain, to the northwest, with endless historic buildings, churches and a spectacular 15th-century cathedral; Calahonda Beach - one of the area's best beaches, featuring a long stretch of fine sand close by, known locally as the Playa de Calahonda; the Costa del Sol Equestrian Art School - in nearby Estepona, offering seasonal horse shows and displays; and the Parque de la Naturaleza Selwo - a top animal park just a short trip from Marbella, full of exotic animals from around the world, together with educational information and gardens. 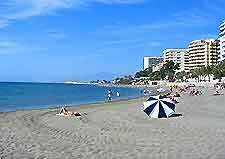 More information about Marbella Attractions Nearby.